GlutamineHi Tec Gluta Fusion - 200 kaps. What is the role in an athlete's body L-glutamine? L-glutamine is the most abundant amino acid in the blood and muscle tissue. This represents up to 60% of the pool of amino acids building muscle proteins and is an essential source of fuel for the cells of the immune system. The importance of glutamine heavy duty strength and endurance equals or even exceeds the role of branched chain amino acids. L-glutamine is an important constitutional nitrogen reservoir, strongly inhibits the processes of muscle tissue degeneration, which reduces. Operation of glutamine is, inter alia, increased hydration of the muscle cells. The large volume of cells stimulates protein synthesis and muscle glycogen. In addition, L-glutamine stimulates the release of growth hormone and insulin, increased glutathione levels in the cells (protects cells from "free radicals"), accelerates muscle glycogen synthesis. This amino acid relieves the symptoms of weakening of the immune system in przetrenowanych athletes. Hi Tec Gluta Fusion is much more than pure L-glutamine! If we want to achieve the maximum benefit when using L-glutamine we need to achieve optimal levels of amino acids in plasma and in muscle cells. The authority, which limits the impact of L-glutamine, is the liver, where it is all kinds of metabolism. Otherwise this amino acid (free form) is unstable in aqueous medium. Composition Hi Tec Gluta Fusion has been designed to minimize adverse events described. Used in the preparation of a-ketoglutarate maximum limits the decomposition of L-glutamine in the liver, which directly increase the bioavailability of muscle cells. The most stable chemical form of glutamine is N-acetyl-L-glutamine (NAG). Due to their structure a stable compound that is converted into inactive metabolites in water and is readily penetrates the blood stream after passing through the digestive tract. The muscle cells NAG drastically increases the concentration of active L-glutamine. 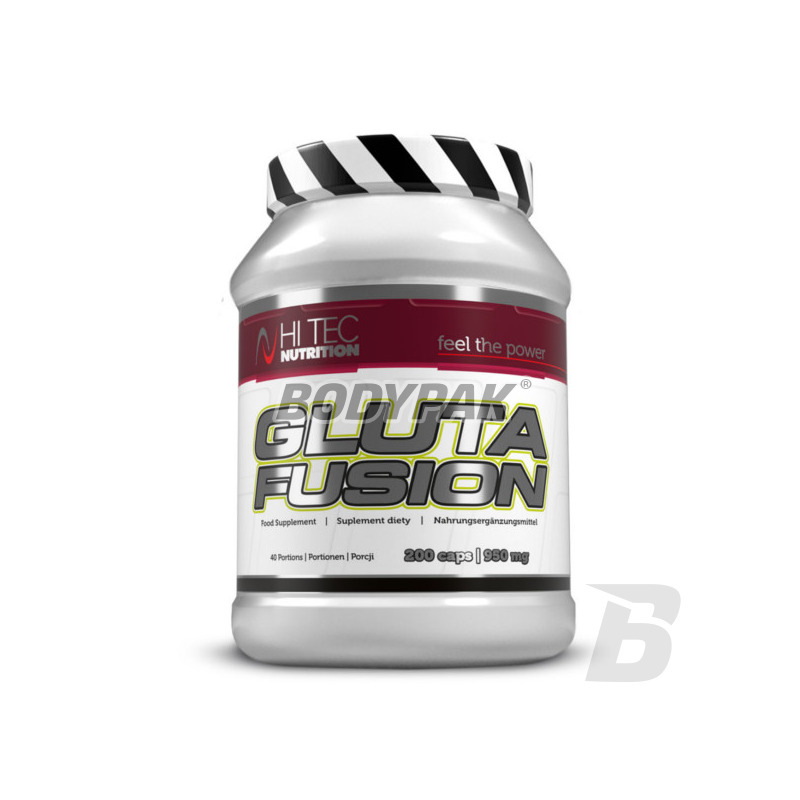 Hi Tec Gluta Fusion formulation increases in a short time, the concentration of the bioactive L-glutamine in plasma and muscle cells, making the most of a catabolic and anabolic potential of the strongest and the most important amino acid - L-glutamine. 1 serving immediately after training. Gluta pierwsza klasa, cena odpowiednia, generalnie super. Chyba pierwsza glutamina jaką stosuje i nie odczuwam jej działania. Szkoda kasy było..